The AKC Miniature Schnauzer is considered an "active dog of the terrier type" (American Kennel Club). Miniature Schnauzers are known for their feisty, energetic personalities and originally bred to hunt and kill vermin. Today's AKC Miniature Schnauzer makes a wonderful obedient and devoted companion. About the AKC: The American Kennel Club is a registry of purebred dog pedigrees in the United States. This national organization is devoted to the advancement and welfare of purebred dogs, provides educational materials for dog owners and also sponsors dog rescue groups for each breed. General Appearance – The Miniature Schnauzer is robust and active resembling his larger cousin, the Standard Schnauzer. Head – The Schnauzer's head is rectangular and strong; forehead unwrinkled; top skull flat. Muzzle – The Miniature Schnauzer's muzzle is strong in proportion to skull; ending in a moderate blunt. Eyes - The Miniature Schnauzer eyes are small and a very dark brown color. They are oval in appearance and the Schnauzer eyes are keen and insightful in expression. Ears – The uncropped Mini Schnauzer ears are small and V-shaped, folding close to the skull. Neck – The Miniature Schnauzer neck is strong and well arched, blending into the Schnauzer's shoulders. Skin fits tightly at the throat. Body - The Mini Schnauzer body is short and deep. The underbody does not present a tucked-up appearance at the flank. 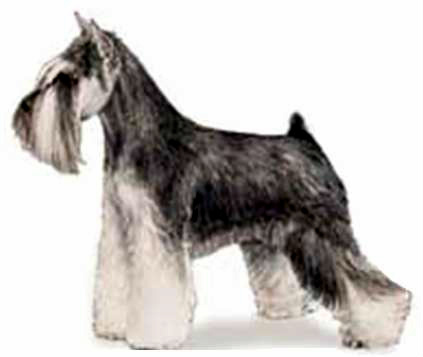 Tail – The Miniature Schnauzer tail is set high, carried erect, and docked long enough to be clearly visible over the backline of body. Forelegs - The forelegs of the Miniature Schnauzer are straight and parallel when viewed from all sides. Hindquarters - The hindquarters of the Miniature Schnauzer are strong muscled with slanting thighs. Feet - Mini Schnauzer's paws are short and round with thick black pads. Toes are arched and compact. Coat – The Schnauzer coat is a double coat. A hard, wiry outer coat and close, smooth undercoat. Color – An AKC Miniature Schnauzer comes in 3 recognized colors which are: salt and pepper, black and silver, and solid black. Info on White Miniature Schnauzers. Temperament - The Miniature Schnauzer should be alert and spirited, yet obedient to command. The Miniature Schnauzer is of German origin said to be recognizable in pictures of the 15th century. The Miniature Schnauzer is derived from the Standard Schnauzer and is said to have come from mixing Affenpinschers and Poodles with small Standard Schnauzers. The Miniature Schnauzer was exhibited as a distinct breed ~ 1899. The Miniature Schnauzer was originally bred to be a small farm dog, able to go to ground for all kinds of vermin. Today the Miniature Schnauzer is an elegant dog of the Terrier Group and viewed primarily as a charming, attractive, and affectionate companion. He is of good health, good temperament, and devoted to his home and family. 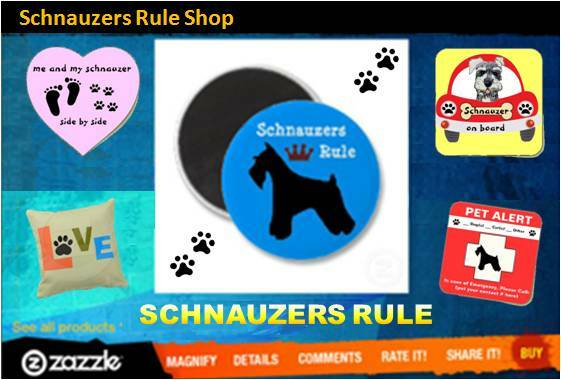 Information provided by The American Kennel Club Miniature Schnauzer Breed Standard. 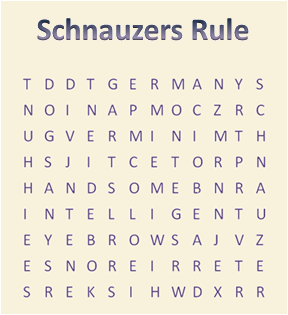 There are 15 words in the word search puzzle below, that can be used in describing a Miniature Schnauzer. Can you help us find them all? Post an answer in the comments below! FUN!